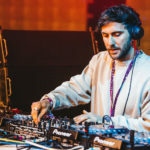 Hot Since 82’s Knee Deep In Sound imprint has had a damn good year. Rallying Steve Lawler, Cristoph and Mendo alike for its Summer output, the label has seldom had to rest on the big name sales point — they deliver quality at every turn. Having spent a good deal of 2015 split between releases for LOST and Suara, Leftwing & Kody have followed suit with the positive movement in the name of underground house gold dust. As the leader of three brand new cuts for Knee Deep, “Carnival” kicks back into that attitude soaked tech house etiquette that has kept the duo in constant rotation over the past two years. The grooves creep on and the coarse leads fall just right, beautifully reminding us how buoyant the duo’s signature blend of coherent club records with a sinister undertones remains amid the gold rush towards anything remotely underground and house-oriented. Leftwing & Kody are yet to drop a bad record where 2015 is concerned and, if “Carnival” is anything to go by, they aren’t anywhere near making the leap.